The problem is familiar to almost everyone who works abroad. You need access to a computer, but you don’t have your own computer with you. Perhaps you don’t have a laptop, or it wasn’t convenient to bring it along this time. Instead, you’re forced to use a computer in an Internet café or the business site where you’re currently working. It’s certainly a lot better than nothing, but it’s not your computer. It may be running an operating system you’re not familiar with or don’t like much. Your precious bookmarks aren’t available. Your favourite programs aren’t installed. And your installation rights may be limited or non-existent; and besides, you don’t have the installation discs with you. Fortunately, a solution is at hand : the humble USB stick. 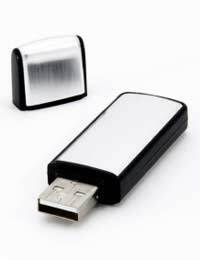 USB memory sticks came on to the market a few years ago offering limited amounts of storage – typically about 250 megabytes – to help you port small files between different computers. Since then, their storage capacity has increased greatly and their price has come down too. You can now pick up generously-endowed 8 or 16 Gigabyte units very cheaply indeed. This much storage space changes the ball game completely. It means that, rather than being limited to carrying a few files around, USB sticks can now contain entire software suites, even operating systems! For those working abroad, this is a godsend. It means you can carry your own personalised computing environment around with you on a tiny stick the size of a key ring! You could, of course, carry around installation files for all your favourite programs on your USB stick. Whenever you were forced to use another computer, you could install them all before use. But this approach has several drawbacks. You may not have installation rights. Even if you do, installing software can be time-consuming; even then, you wouldn’t have the benefit of any saved configuration of the software you may have set up previously; and neither you nor whoever owns the computer may be thrilled about you leaving a lot of software residue behind you. Wouldn’t it be better if you could just run your software from the USB stick? Well, you can. Unfortunately, not all software can be run in this way. Many applications are not autonomous entities, but have dependencies elsewhere on the computer. They may use shared libraries or store vital parts of their configuration in the computer registry, for example. Some software is specifically designed to be portable however, capable of being run from a USB stick. These are called Portable Apps, and they conform to the Portable App standard, which defines acceptable behaviour for a portable app, mandating, for example, that it use no configuration data other than what is on the USB stick, and that it leave nothing behind on the host computer. A wide range of software is now available in the Portable App format, including browsers and office software. U3 is a similar standard which was defined originally by SanDisk, one of the major manufacturers of USB memory sticks. U3 applications are also designed to be self-contained. Unlike the more generic Portable App concept, however, U3 only works with Microsoft Windows and with hardware and software which have been especially designed for it. U3 drives come with password protection built in, and most also include some anti-virus software to prevent you contracting a nasty infection in the Internet café. Let’s say you’re a Linux buff, morose at the prospect of having to use Microsoft Windows everywhere you go. Or you prefer Windows XP, but find Vista is being shoved down your throat left, right and centre. Good news. It’s possible to install an operating on a USB drive and use it from there. There are lots of options available in this regard. Most require some degree of technical tinkering but instructional guides can be found on the web. With some configurations, you will be able to install a new operating system over the existing one; others will allow you to boot to the operating system on your flash drive instead of the one installed on the hard drive; still others will allow you to run your favourite operating system from the USB stick without even having to reboot. The Linux options are many and various; the Windows options less so, because Windows is proprietary and running the operating system in this way is not officially supported by Microsoft, although there are rumours that Microsoft intends to introduce a USB-stick based Windows personalisation technology called Startkey in future. USB drives have been one of the great liberating technologies for travellers in recent times. But many people have yet to realise their full potential! PDA or Smartphone: Adequate Substitute for a Laptop?